Jewish Arabic poet of the seventh century; contemporary of Mohammed. According to Ibn Hisham ("Kitab Sirat Rasul Allah," ed. Wüstenfeld, pp. 690, 713) and Abu al-Faraj al-Iṣbahani ("Kitab al-Aghani," viii. 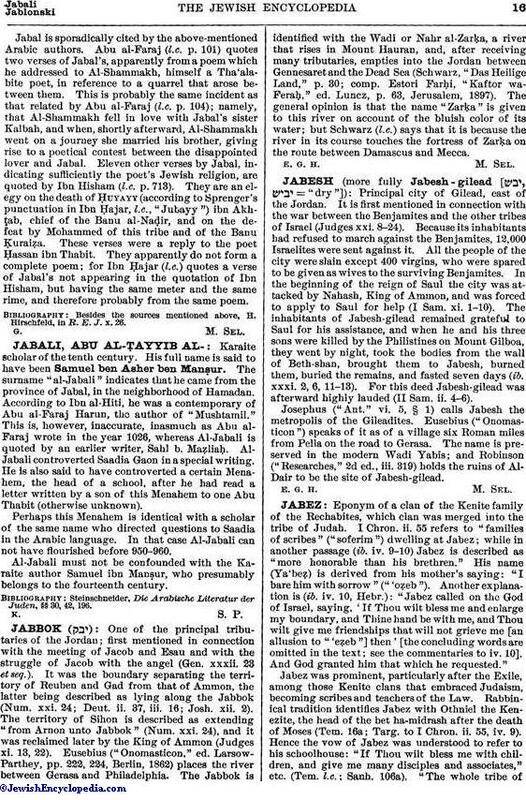 104), Jabal was a Tha'alabite (Abu al-Faraj gives the whole genealogy), but neither of them mentions the fact that he was a Jew. Ibn Ḥajar, however, in his biographical dictionary "Kitab al-Aṣabah fi Tamyiz al-Ṣaḥabah" (ed. Sprenger, i. 453), relying on Ibn al-Kalbi and on Al-Marzabani, declares that such was the case and that Jabal subsequently embraced Islam. Yaḳut ("Mu'jam," i. 765), quoting a verse of Jabal, calls him erroneously "Jamal ibn Jawwal al-Taghlabi." Jabal is sporadically cited by the above-mentioned Arabic authors. Abu al-Faraj (l.c. p. 101) quotes two verses of Jabal's, apparently from a poem which he addressed to Al-Shammakh, himself a Tha'alabite poet, in reference to a quarrel that arose between them. This is probably the same incident as that related by Abu al-Faraj (l.c. p. 104); namely, that Al-Shammakh fell in love with Jabal's sister Kalbah, and when, shortly afterward, Al-Shammakh went on a journey she married his brother, giving rise to a poetical contest between the disappointed lover and Jabal. 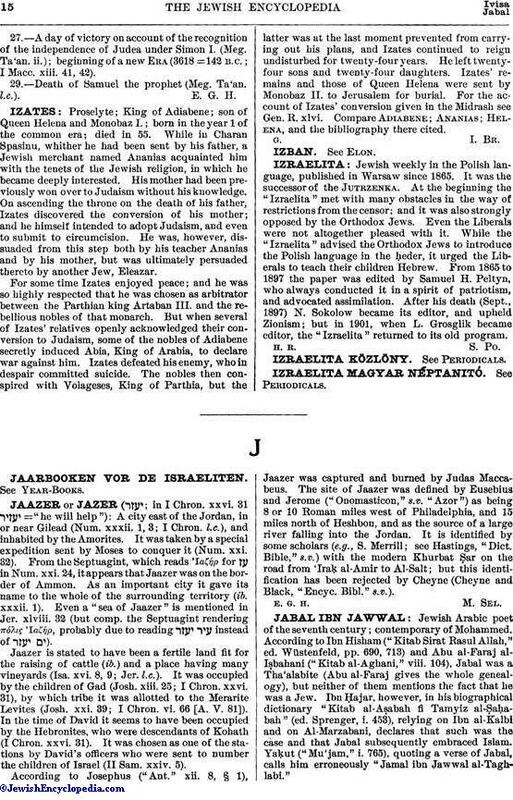 Eleven other verses by Jabal, indicating sufficiently the poet's Jewish religion, are quoted by Ibn Hisham (l.c. p. 713). They are an elegy on the death of Ḥuyayy (according to Sprenger's punctuation in Ibn Ḥajar, l.c., "Jubayy") ibn Akhṭab, chief of the Banu al-Naḍir, and on the defeat by Mohammed of this tribe and of the Banu Ḳuraiẓa. These verses were a reply to the poet Ḥassan ibn Thabit. They apparently do not form a complete poem; for Ibn Ḥajar (l.c.) quotes a verse of Jabal's not appearing in the quotation of Ibn Hisham, but having the same meter and the same rime, and therefore probably from the same poem. Besides the sources mentioned above, H. Hirschfeld, in R. E. J. x. 26.